Foreword. 1. 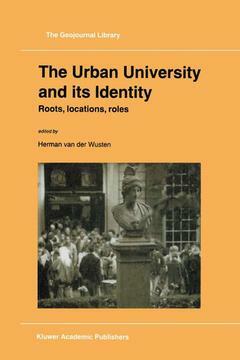 A Warehouse of Precious Goods: The University in its Urban Context, H. van der Wusten. Part I: Roots. 2. Scholarship, Local Life, and the Necessity of Worldliness, T. Bender. 3. Politics and the University, P. Claval. 4. The World of Arts and the University, J. Musil. Part II: Locations. 5. The Hebrew University of Jerusalem: Earthly Planning in a Heavenly City, A. Shachar. 6. Louvain-la-Neuve: a New City for an Old University, M. Woitrin. 7. Rome: Three Universities in Search of Actors - A Capital City Case, M. Ottolenghi, A.L. Palazzo. 8. Amsterdam, Utrecht, Groningen: Universities' Locational Interests and Urban Politics, J. Groenendijk. Part III: Roles. 9. A Shared Space in a Divided Society: The Queen's University of Belfast, F.W. Boal, K. Logan. 10. Corrupt Capital, Reformed Academy: Beijing and the Identity of Beijing University, 1898-1919, T.B. Weston. 11. Developing and Sustaining an Urban Mission: Concordia University in Montreal, M. Barlow. 12. The University and the City Council: the Political Interface in Portsmouth UK, A. Burnett. 13. Urban Change and Institutional Adaptation: The Geographic Identity of the University of Miami, J. Nijman. This volume explores the history of the urban university and its political and cultural traditions. In case studies, situated in different parts of the Western World and China, two basic aspects of the modern urban university's identity are analyzed: the locations of the universities within cities and the ways in which their administrators present the university in the local political arena. Locational choices and public appearances are interpreted from a historical and traditional perspective. Audience: This book will be of particular interest to human geographers, planners and university administrators.